Jellyfish are the primary food source for the enigmatic sea turtle, and as such already part of the charismatic fauna of the ocean; it’s just a question of whether they receive credit for their support of the ecosystem. 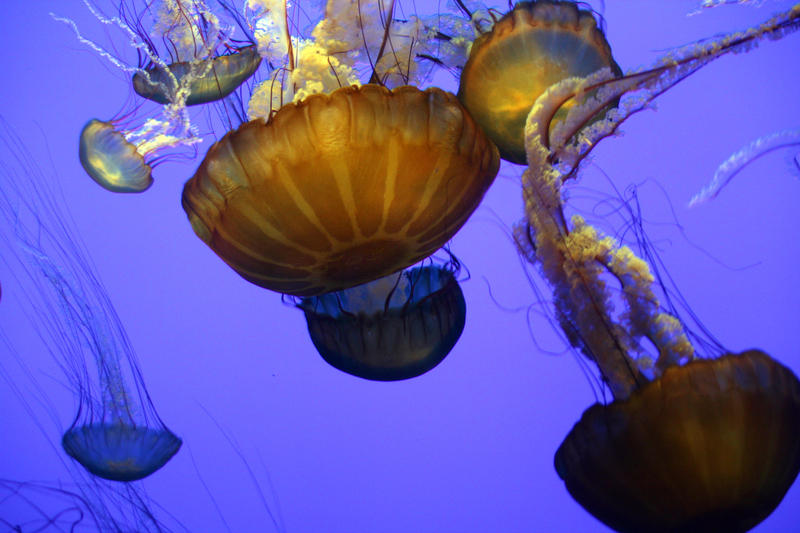 Besides providing a platform at the base of the ecosystem, jellyfish may also increase productivity of marine systems by stirring the water through their water-propelled swimming. And in many places, they enter the human food chain as well in the form of traditional Chinese and Japanese dishes such as the jellyfish salad often served at Chinese weddings. And their popularity as food is spreading. Jellies are beautiful in their own right, not just because of the ecosystem services they provide. Watching their bells balloon rhythmically in and out propelling the jellyfish like ballerinas can keep my eyes glued to an aquarium for hours. In fact, the Georgia aquarium includes jellyfish t-shirts, stuffed animals, and other memorabilia in their gift shop so you can bring a piece of that beauty home along with your stuffed turtle or dolphin. The Monterey Bay aquarium has popular paperweight and window decoration (some glow-in-the-dark) containing glass jellyfish designs from local glassblowers. Proof that jellyfish can be the subject of some great art. The number of jellyfish have been on the rise in recent years, though, theoretically linked to ocean acidification. As the pH of ocean water falls, shellfish and other competitors have a hard time building shells out of calcium that dissolves more easily in more acidic water. Therefore, the jellies are gaining an advantage and have resulted in annual summer blooms of jellyfish in many parts of the world, predominantly in warm, productive coastal and bay waters. Because of their rising numbers and rising position in popular culture, Smithsonian has dubbed them “The Next King of the Sea”. So next time you see one in your swimming hole, say hi, don’t run in fear. Jelly fish are my favorite creatures. When I was a child I found one washed ashore in the island where I grew up. Refusing to admit defeat, I fished it out in a bowl, named it Lakitu and proclaimed it my boyfriend. I eventually realized it was dead and buried it at sea, but the lover affair, so to speak, was just beginning. I’ve never had a chance to eat a jellyfish. How are they fished? Do they reproduce fast enough to be widely used as a food source, or will it remain a more gourmet thing? I’m not sure how they’re fished, so can’t speak to that part of the question but I know it takes many individual jellies, generally dried for sale in the market, to really make a snack or meal. I’m guessing it’ll remain a gourmet thing.